Syracuse coach Jim Boeheim speaks during a press conference. Mandatory Photo Credit: Kicia Sears, The Juice Online. April is a busy month in the sports world. The Final Four – congrats, Virginia – is quickly followed by The Masters. If listening to Jim Nantz spend the weekend throwing around a whole bunch of “oh dears” and “he’s got a lot of work left to dos” over missed 3-foot putts *eye roll* isn’t your thing, baseball is in full swing and the NFL Draft is just around the corner. But for college hoops heads, April means the Spring period to sign National Letters of Intent. This year it runs from April 17 to May 15. Syracuse is expected to sign Jesse Edwards, a 6-foot-11, 205-pound prospect currently playing at IMG Academy in Florida. One player who won’t be signing with the Orange is Isaiah Stewart, formerly of Rochester. Stewart plans on signing with former Syracuse Coach-in-Waiting Mike Hopkins and the Washington Huskies. Landing the 5-star Stewart, one of the most sought after players in his class, was a major score for Hopkins, and, a big loss for the Orange. But Stewart wasn’t the first New York kid to spurn the Orange and he won’t be the last. 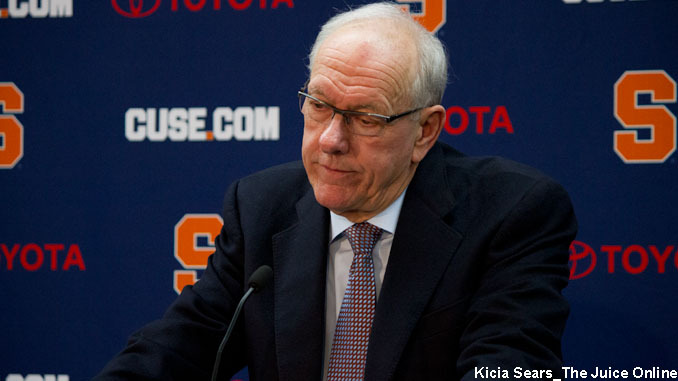 Here’s a look at five recruiting misses Syracuse has endured during the Jim Boeheim era. Marbury seemed like a sure bet to wear Orange. Until he opted for Bobby Cremins and the Georgia Tech Yellow Jackets. Marbury played one year for Georgia Tech before opting for life in the NBA. Before Marbury, there was Kenny Anderson. Another New York City point guard who preferred Cremins and Georgia Tech. Anderson was part of the famous Lethal Weapon 3 triumvirate along with Brian Oliver and Dennis Scott. Foyle actually chose Colgate – yes, Colgate! – instead of the Orange. Foyle went on to play in the NBA for 14 years. Mashburn played three years for Rick Pitino at Kentucky. During his final season, he led the Wildcats to the Final Four along with notable bluebloods North Carolina, Kansas, and the Fab Five of Michigan. Mashburn played 11 seasons in the NBA. Lopez was one of the most sought-after recruits to ever come out of New York City. Lopez eventually signed with St. John’s. While he never seemed to live up to the hype in college, Lopez did play four years in the NBA after being a late first round draft pick. Other notable New Yorkers who looked elsewhere for a college hoops home include Sam Perkins, King Rice, Christian Laettner, Elton Brand, and Zendon Hamilton. Before you hold any pity parties for Syracuse, Jim Boeheim and his staffs have managed to land their share of impact New York recruits over the years. That list includes Pearl Washington, John Wallace, Jonny Flynn, Paul Harris, Adrian Autry, Otis Hill, Lazarus Sims, Jason Cipolla, Tyler Lydon, and James Southerland. Disclaimer: By no means am I saying either list is the Be All End All of New York High School Basketball recruits. So if I missed one or two well-known players, don’t @ me on Twitter, as the kids say. So when Stewart does sign with the Huskies later this April, it isn’t the end of the world. Syracuse will still get players, they’ll still trap in the corners out of the 2-3 zone, and who knows, maybe they’ll beat Duke again next year. And yes, Jim Boeheim will once again land an impact New York recruit. Perhaps sooner than you think.